Does a gas have just two specific heat capacities or more than two? Is the number of specific heat capacities of a gas countable? No, a gas doesn’t have just two specific heat capacities, as the heat capacities depend on the process followed. There are infinite processes; therefore, there can be infinite number of specific heat capacities. Can we define specific heat capacity at constant temperature? ΔT = 0; therefore, s = infinity. So, we cannot define specific heat capacity at constant temperature. Can we define specific heat capacity for an adiabatic process? ∆Q = 0 and hence, s = 0. Therefore, in an adiabatic process, specific heat capacity is zero. Does a solid also have two kinds of molar heat capacities Cp and Cv? If yes, is Cp > Cv? Or is Cp − Cv = R? Yes, a solid also has two kinds of molar heat capacities, Cp and Cv. In a solid, expansion coefficient is quite small; therefore dependence of heat capacity on the process is negligible. So, Cp > Cv with just a small difference, which is not equal to R.
In a real gas, the internal energy depends on temperature and also on volume. The energy increases when the gas expands isothermally. Examining the derivation of Cp − Cv = R, find whether Cp − Cv will be more than R, less than R or equal to R for a real gas. Cp-Cv=R+k dT⇒Cp-Cv>R,where Cp and Cv are the specific heat capacities at constant pressure and volume, respectively. Can a process on an ideal gas be both adiabatic and isothermal? ΔQ=ΔU+ΔW⇒ΔQ=nCvΔT+ΔW⇒0=nCv(0)+ΔW⇒ΔW=0,where Cv is the heat capacity at constant volume. This shows that if the process is adiabatic as well as isothermal, no work will be done. So, a process on an ideal gas cannot be both adiabatic and isothermal. Show that the slope of the p−V diagram is greater for an adiabatic process compared to an isothermal process. γ and dPdV are the slope of the curve and the ratio of heat capacities at constant pressure and volume, respectively; P is pressure and V is volume of the system. γ>1, we can see that the slope of the P-V diagram is greater for an adiabatic process than an isothermal process. Is a slow process always isothermal? Is a quick process always adiabatic? PVγ=k, γ=CPCV > 1 is the ratio of heat capacities at constant pressure and volume, respectively, and k is a constant. In this process, a small increase in volume produces a large decrease in pressure. Therefore, an isothermal process is considered to be a slow process and an adiabatic process a quick process. Can two states of an ideal gas be connected by an isothermal process as well as an adiabatic process? ⇒V123 = V223⇒V1 = V2If this condition is met, then the two states can be connected by an isothermal as well as an adiabatic process. The ratio Cp / Cv for a gas is 1.29. What is the degree of freedom of the molecules of this gas? where f is the degree of freedom. Given: γ=1.29⇒1+2f=1.29=97⇒2f=97-1⇒2f=27⇒f=7Therefore, the molecules of this gas have 7 degrees of freedom. But in reality, no gas can have more than 6 degrees of freedom. (d) CA and CB cannot be defined. ∆U is the change in internal energy produced. Since the temperature rises by the same amount in both processes, change in internal energies are same, i.e. For a solid with a small expansion coefficient, work done in a process will also be small. Thus, the specific heat depends slightly on the process. Therefore, Cp is slightly greater than Cv. Cp − Cv = R for the gas in state A, which means it is acting as an ideal gas in that state, whereas Cp − Cv = 1.08R in state B, i.e. the behaviour of the gas is that of a real gas in that state. To be an ideal gas, a real gas at STP should be at a very high temperature and low pressure. Therefore, PA < PB and TA > TB where PA and PB denotes the pressure and TA and TB denotes the temperature of system A and B reepectively. Let Cv and Cp denote the molar heat capacities of an ideal gas at constant volume and constant pressure respectively. Which of the following is a universal constant? For an ideal gas, Cp − Cv = R , where Cv and Cp denote the molar heat capacities of an ideal gas at constant volume and constant pressure, respectively and R is the gas constant whos value is 8.314 J/K. Therefore, Cp − Cv is a constant. On the other hand, the ratio of these two varies as the atomicity of the gas changes. Also, their sum and product are not constant. Therefore, 50 calories need to be supplied to raise the temperature of 2 moles of gas from 30-35 oC at constant volume. The figure shows a process on a gas in which pressure and volume both change. The molar heat capacity for this process is C.
Consider two processes AB and ACB; let W be the work done. C is the molar heat capacity of process AB. Process ACB can be considered as the sum of the two processes, AC and CB. The molar heat capacity of process AC is Cp, as pressure is constant in this process and the molar heat capacity of process CB is Cv, as volume is constant in it. UAB = UACBWAB>WACBWork done in the p-V diagram is the area enclosed under the curve. ⇒WAB+UAB>WACB+UACB⇒C>Cv+CpMolar heat capacity is the heat supplied per mole to change the temperature by a degree Kelvin and according to the first law of thermodynamics, dQ = dU + dW, where dQ is the heat supplied to the system in a process. p=kVg⇒pVg=k,such that the process is adiabatic in which there’s no heat supplied to the system, i.e. Q = 0. Molar heat capacity is the amount of heat supplied to the system per mole to produce a degree change in temperature. Also, in an adiabatic process, no heat exchange is allowed. So, molar heat capacity equals zero, i.e. C = 0.
pV=p’V’⇒pV=p+0.5100pV⇒pV=100.5100pV’⇒V’=100100.5V⇒V’-V = 100100.5V-V=-0.5100.5=-0.49%So, volume V’ decreases by about 0.5% of V.
Therefore, V, is 0.36 % less than V.
Two samples A and B are initially kept in the same state. Sample A is expanded through an adiabatic process and the sample B through an isothermal process. The final volumes of the samples are the same. The final pressures in A and B are pA and pB respectively. (d) The relation between pA and pB cannot be deduced. Let the initial states of samples A and B be i and the final states of samples B and A be f and f’, respectively. Let the final volumes of both be Vo. As sample A is expanded through an adiabatic process, its curve in the p-V diagram is steeper than that of sample B, which is expanded through an isothermal process. Therefore, from the p-V diagram, pA < pB. Let Ta and Tb be the final temperatures of the samples A and B, respectively, in the previous question. (d) The relation between Ta and Tb cannot be deduced. As sample B is undergoing expansion through an isothermal process, its initial and final temperatures will be same, i.e. Tb. On the other hand, sample A is at the same initial state as B, such that the initial temperature of A is â€‹Tb and it is expanding through an adiabatic process in which no heat is supplied. Therefore, sample A will expand at the cost of its internal energy and its final temperature will be less than its initial temperature. This implies that Ta < Tb. Let âˆ†Wa and âˆ†Wb be the work done by the systems A and B, respectively, in the previous question. (d) The relation between âˆ†Wa and âˆ†Wb cannot be deduced. In the p-V diagram, the area under the curve w.r.t the V axis is equal to the work done by the system. Since the area under the isotherm is greater than that under the adiabat, the work done by system A is less than that done by system B. Hence, âˆ†Wa < âˆ†Wb. Molar specific heat capacity has direct dependence on the degree of freedom of gas molecules. As temperature is increased, the gas molecules start vibrating about their mean position, leading to change (increase) in the degree of freedom and, hence, increasing molar heat capacity. Due to sudden compression, the gas did not get sufficient time for heat exchange. So, no heat exchange occurred. Therefore, the process may be adiabatic. For any process to be isothermal, its temperature should remain constant, i.e. pressure and volume should change simultaneously while their product (temperature) should be constant. Let Q and W denote the amount of heat given to an ideal gas and the work done by it in an isothermal process. In an isothermal process, temperature of the system stays constant, i.e. there’s no change in internal energy. Thus, U = 0, where U denotes the change in internal energy of the system. According to the first law of thermodynamics, heat supplied to the system is equal to the sum of change in internal energy and work done by the system, such that Q = U + W. As U = 0, Q = W.
Let Q and W denote the amount of heat given to an ideal gas and the work done by it in an adiabatic process. In an adiabatic process, no heat is supplied to the system; so, Q = 0. According to the first law of thermodynamics, heat given to any system is equal to the sum of the change in internal energy and the work done on the system. So, Q = W+U and as Q = 0, W = –U and Q ≠ W.
The slope of an adiabatic process is greater than that of an isothermal process. Since A and B are initiated from the same initial state, both cannot be isothermal or adiabatic, as they would be overlapping. But the curve of process B is steeper than the curve of process A. Hence, A is isothermal and B is adiabatic. Three identical adiabatic containers A, B and C contain helium, neon and oxygen, respectively, at equal pressure. The gases are pushed to half their original volumes. (a) The final temperatures in the three containers will be the same. (b) The final pressures in the three containers will be the same. (c) The pressures of helium and neon will be the same but that of oxygen will be different. (d) The temperatures of helium and neon will be the same but that of oxygen will be different. γ=CpCv is the ratio of molar heat capacities at constant pressure and volume. γis equal to 1.67 and 1.40 for a monatomic gas and a diatomic gas, respectively. Helium and neon are monatomic gases and oxygen is a diatomic gas. Therefore, changing the state of the gases, i.e. reducing the volume will lead to identical changes in temperature and pressure for helium and neon and that will be different for oxygen. ≃ 32R=1.5×8.314= 12.54 JK-1mol-1. Among the given gases, only helium and argon are inert and, hence, monoatomic. Therefore, the gas may be helium or argon. The energy of a gas is measured as CvT. All the four cylinders are at the same temperature but the gases in them have different values of Cv, such that it is least for the monatomic gas and keeps on increasing as we go from monatomic to tri-atomic. Among the above gases, argon is monatomic, hydrogen and nitrogen are diatomic and carbon dioxide is tri-atomic. Therefore, the energy is minimum in argon. A vessel containing one mole of a monatomic ideal gas (molecular weight = 20 g mol−1) is moving on a floor at a speed of 50 m s−1. The vessel is stopped suddenly. Assuming that the mechanical energy lost has gone into the internal energy of the gas, find the rise in its temperature. 5 g of a gas is contained in a rigid container and is heated from 15°C to 25°C. Specific heat capacity of the gas at constant volume is 0.172 cal g−1 °C−1 and the mechanical equivalent of heat is 4.2 J cal−1. Calculate the change in the internal energy of the gas. So, change in internal energy of the system is 36.12 J. The figure shows a cylindrical container containing oxygen (γ = 1.4) and closed by a 50-kg frictionless piston. The area of cross-section is 100 cm2, atmospheric pressure is 100 kPa and g is 10 m s−2. The cylinder is slowly heated for some time. Find the amount of heat supplied to the gas if the piston moves out through a distance of 20 cm. The specific heat capacities of hydrogen at constant volume and at constant pressure are 2.4 cal g−1 °C−1 and 3.4 cal g−1 °C−1 respectively. The molecular weight of hydrogen is 2 g mol−1 and the gas constant, R = 8.3 × 107 erg °C−1 mol−1. Calculate the value of J.
where Cp and Cv are molar specific heat capacities. The ratio of the molar heat capacities of an ideal gas is Cp/Cv = 7/6. Calculate the change in internal energy of 1.0 mole of the gas when its temperature is raised by 50 K (a) keeping the pressure constant (b) keeping the volume constant and (c) adiabatically. A sample of air weighing 1.18 g occupies 1.0 × 103 cm3 when kept at 300 K and 1.0 × 105 Pa. When 2.0 cal of heat is added to it at constant volume, its temperature increases by 1°C. Calculate the amount of heat needed to increase the temperature of air by 1°C at constant pressure if the mechanical equivalent of heat is 4.2 × 107 erg cal−1. Assume that air behaves as an ideal gas. An ideal gas expands from 100 cm3 to 200 cm3 at a constant pressure of 2.0 × 105 Pa when 50 J of heat is supplied to it. Calculate (a) the change in internal energy of the gas (b) the number of moles in the gas if the initial temperature is 300 K (c) the molar heat capacity Cp at constant pressure and (d) the molar heat capacity Cv at constant volume. An amount Q of heat is added to a monatomic ideal gas in a process in which the gas performs a work Q/2 on its surrounding. Find the molar heat capacity for the process. where Cp is the molar heat capacity at constant pressure. Relation between pressure and volume of a gas is P = kV. Ideal gas equation is PV = nRT. For simplicity, take the number of moles of a gas, n = 1. An ideal gas (Cp / Cv = γ) is taken through a process in which the pressure and the volume vary as p = aVb. Find the value of b for which the specific heat capacity in the process is zero. As the process has specific heat capacity zero, the process is essentially an adiabatic process. Two ideal gases have the same value of Cp / Cv = γ. What will be the value of this ratio for a mixture of the two gases in the ratio 1 : 2? Cv=Cv1+2Cv23=R(γ-1)+2R(γ-1)3=3R(γ-1)3=Rγ-1Hence, Cp / Cv in the mixture is γ. A mixture contains 1 mole of helium (Cp = 2.5 R, Cv = 1.5 R) and 1 mole of hydrogen (Cp = 3.5 R, Cv = 2.5 R). Calculate the values of Cp, Cv and γ for the mixture. CVis the heat capacity of the mixture. R=253J K-1 mol-1. (a) Find the temperature of the gas in the states a, b, c and d. (b) Find the amount of heat supplied in the processes ab and bc. (c) Find the amount of heat liberated in the processes cd and da. Tb=PbVbnRTb=100×103×10000×10-60.5×253Tb=240 K Similarly, temperature at c is 480 K and at d is 240 K.
dQ=12×Rγγ-1(Tb-Ta)dQ=12×25×53×353-1×(240-120)dQ=12×1259×32×(120)dQ=1250 JFor line bc, volume is constant. So, it is an isochoric process. An ideal gas (γ = 1.67) is taken through the process abc shown in the figure. The temperature at point a is 300 K. Calculate (a) the temperatures at b and c (b) the work done in the process (c) the amount of heat supplied in the path ab and in the path bc and (d) the change in the internal energy of the gas in the process. (a) For line ab, volume is constant. T2=200×300100=600 KFor line bc, pressure is constant. The volume is changing from 100 to 150 cm3 . (c) For ab (isochoric process), work done = 0. = 39.850 − 10 = 29.850 J. The volume of an ideal gas (γ = 1.5) is changed adiabatically from 4.00 litres to 3.00 litres. Find the ratio of (a) the final pressure to the initial pressure and (b) the final temperature to the initial temperature. Since the process is adiabatic, PVγ = constant. Air (γ = 1.4) is pumped at 2 atm pressure in a motor tyre at 20°C. If the tyre suddenly bursts, what would be the temperature of the air coming out of the tyre? Neglect any mixing with the atmospheric air. A gas is enclosed in a cylindrical can fitted with a piston. The walls of the can and the piston are adiabatic. The initial pressure, volume and temperature of the gas are 100 kPa, 400 cm3 and 300 K, respectively. The ratio of the specific heat capacities of the gas, Cp / Cv = 1.5. Find the pressure and the temperature of the gas if it is (a) suddenly compressed (b) slowly compressed to 100 cm3. (a) The gas is suddenly compressed to volume, V2 = 100 cm3 . So, this is an adiabatic process. (b) If the container is slowly compressed, the heat transfer is zero, even thought the walls are adiabatic. The initial pressure and volume of a given mass of a gas (Cp/Cv = γ) are p0 and V0. The gas can exchange heat with the surrounding. (a) It is slowly compressed to a volume V0/2 and then suddenly compressed to V0/4. Find the final pressure. (b) If the gas is suddenly compressed from the volume V0 to V0/2 and then slowly compressed to V0/4, what will be the final pressure? (i) As the gas is slowly compressed, its temperature will remain constant. (ii) Sudden compression means that the gas could not get sufficient time to exchange heat with its surroundings. So, it is an adiabatiac compression. 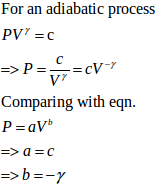 Consider a given sample of an ideal gas (Cp/Cv = γ) having initial pressure p0 and volume V0. (a) The gas is isothermally taken to a pressure p0/2 and from there, adiabatically to a pressure p0/4. Find the final volume. (b) The gas is brought back to its initial state. It is adiabatically taken to a pressure p0/2 and from there, isothermally to a pressure p0/4. Find the final volume. A sample of an ideal gas (γ = 1.5) is compressed adiabatically from a volume of 150 cm3 to 50 cm3. The initial pressure and the initial temperature are 150 kPa and 300 K. Find (a) the number of moles of the gas in the sample (b) the molar heat capacity at constant volume (c) the final pressure and temperature (d) the work done by the gas in the process and (e) the change in internal energy of the gas. Three samples A, B and C of the same gas (γ = 1.5) have equal volumes and temperatures. The volume of each sample is doubled, the process being isothermal for A, adiabatic for B and isobaric for C. If the final pressures are equal for the three samples, find the ratio of the initial pressures. There are three gases A, B and C.
VA = VB = VC and TA = TB = TC . For A, the process is isothermal and for an isothermal process, PV = constant. ⇒PB’=PB21.5For C, the process is isobaric, which implies that the pressure will remain constant. Two samples A and B, of the same gas have equal volumes and pressures. The gas in sample A is expanded isothermally to double its volume and the gas in B is expanded adiabatically to double its volume. If the work done by the gas is the same for the two cases, show that γ satisfies the equation 1 − 21−γ = (γ − 1) ln2. Given, V2 = 2 V1, for each case. W=P1V1-P2V2γ-1It is given that same work is done in both cases. 1 litre of an ideal gas (γ = 1.5) at 300 K is suddenly compressed to half its original volume. (a) Find the ratio of the final pressure to the initial pressure. (b) If the original pressure is 100 kPa, find the work done by the gas in the process. (c) What is the change in internal energy? (d) What is the final temperature? (e) The gas is now cooled to 300 K keeping its pressure constant. Calculate the work done during the process. (f) The gas is now expanded isothermally to achieve its original volume of 1 litre. Calculate the work done by the gas. (g) Calculate the total work done in the cycle. (a) The process is adiabatic because volume is suddenly changed; so, no heat exchange is allowed. dQ = 0, as it is an adiabatic process. (e) The pressure is kept constant. Figure shows a cylindrical tube with adiabatic walls and fitted with an adiabatic separator. The separator can be slid into the tube by an external mechanism. An ideal gas (γ = 1.5) is injected in the two sides at equal pressures and temperatures. The separator remains in equilibrium at the middle. It is now slid to a position where it divides the tube in the ratio 1 : 3. Find the ratio of the temperatures in the two parts of the vessel. For an adiabatic process, TVγ−1 = constant . As it is an adiabatic process and all the other conditions are same, the above equation can be applied. In the new position, the slid is dividing the tube in the ratio 3:1. Figure shows two rigid vessels A and B, each of volume 200 cm3, containing an ideal gas (Cv = 12.5 J K−1 mol−1). The vessels are connected to a manometer tube containing mercury. The pressure in both the vessels is 75 cm of mercury and the temperature is 300 K. (a) Find the number of moles of the gas in each vessel. (b) 5.0 J of heat is supplied to the gas in vessel A and 10 J to the gas in vessel B. Assuming there’s no appreciable transfer of heat from A to B, calculate the difference in the heights of mercury in the two sides of the manometer. Gas constant, R = 8.3 J K−1 mol−1. 75 cm of Hg = 99991.5 N/m2n=PVRT=99991.5×200×10-68.3×300=8031.4×10-6=0.008(b) Heat is supplied to the gas, but dV is zero as the container has rigid walls. PT=PATAbecause volume is kept constant. The figure shows two vessels with adiabatic walls, one containing 0.1 g of helium (γ = 1.67, M = 4 g mol−1) and the other containing some amount of hydrogen (γ = 1.4, M = 2 g mol−1). Initially, the temperatures of the two gases are equal. The gases are electrically heated for some time during which equal amounts of heat are given to the two gases. It is found that the temperatures rise through the same amount in the two vessels. Calculate the mass of hydrogen. Since it is an adiabatic environment and the system is not dong any external work, the amount of heat given will be used up entirely to raise its internal energy. =m2×Rγ-1×dT=m2×R1.4-1×dT,where m is the required mass of H2. Two vessels A and B of equal volume V0 are connected by a narrow tube that can be closed by a valve. The vessels are fitted with pistons that can be moved to change the volumes. Initially, the valve is open and the vessels contain an ideal gas (Cp/Cv = γ) at atmospheric pressure p0 and atmospheric temperature T0. The walls of vessel A are diathermic and those of B are adiabatic. The valve is now closed and the pistons are slowly pulled out to increase the volumes of the vessels to double the original value. (a) Find the temperatures and pressures in the two vessels. (b) The valve is now opened for sufficient time so that the gases acquire a common temperature and pressure. Find the new values of the temperature and pressure. The temperature inside the adiabatic vessel does not remain constant. (b) When the valves are open, the temperature remains T0 throughout, i.e. T1 = T2 = T0 . P0(pressure is an intrinsic variable). On side 2, pressure will change to accommodate the changes in temperature on this side. The figure shows an adiabatic cylindrical tube of volume V0 divided in two parts by a frictionless adiabatic separator. Initially, the separator is kept in the middle, an ideal gas at pressure p1 and temperature T1 is injected into the left part and another ideal gas at pressure p2 and temperature T2 is injected into the right part. Cp/Cv = γ is the same for both the gases. The separator is slid slowly and is released at a position where it can stay in equilibrium. Find (a) the volumes of the two parts (b) the heat given to the gas in the left part and (c) the final common pressure of the gases. (b) Since the whole process takes place in adiabatic surroundings, the separator is adiabatic. Hence, heat given to the gas in the left part is 0. (c) There will be a common pressure ‘P‘ when equilibrium is reached. The slid will move until the pressure on the two sides becomes equal. An adiabatic cylindrical tube of cross-sectional area 1 cm2 is closed at one end and fitted with a piston at the other end. The tube contains 0.03 g of an ideal gas. At 1 atm pressure and at the temperature of the surrounding, the length of the gas column is 40 cm. The piston is suddenly pulled out to double the length of the column. The pressure of the gas falls to 0.355 atm. Find the speed of sound in the gas at atmospheric temperature. The speed of sound in hydrogen at 0°C is 1280 m s−1. The density of hydrogen at STP is 0.089 kg m−3. Calculate the molar heat capacities Cp and Cv of hydrogen. 4.0 g of helium occupies 22400 cm3 at STP. The specific heat capacity of helium at constant pressure is 5.0 cal K−1 mol−1. Calculate the speed of sound in helium at STP. An ideal gas of density 1.7 × 10−3 g cm−3 at a pressure of 1.5 × 105 Pa is filled in a Kundt’s tube. When the gas is resonated at a frequency of 3.0 kHz, nodes are formed at a separation of 6.0 cm. Calculate the molar heat capacities Cp and Cv of the gas. Standing waves of frequency 5.0 kHz are produced in a tube filled with oxygen at 300 K. The separation between the consecutive nodes is 3.3 cm. Calculate the specific heat capacities Cp and Cv of the gas.